Looking for a job in Bartholomew County Indiana? The following is a guide of Bartholomew County Indiana employers and job seeker resources. Major cities covered include Columbus. The Greater Columbus Indiana Economic Development has indicated that the actual commuting region is home to 1.7 million people within approximately 35 miles offering an active labor force of 884,000 persons. The MSA population is just below 80,000. 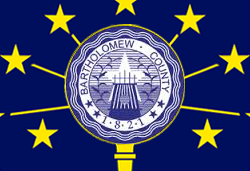 Bartholomew County often has listings posted. During this review there were open positions available for 911 Dispatcher, Deputy Sheriff, Systems Administrator, and Highway Mechanic. Check for updates. The City of Columbus Job Board is a great resource to monitor for ongoing recruitments. During this survey jobs found had included Water and Wastewater Supervisor, Airport Maintenance Technician, Columbus Police Department Full-Time Officer, Sanitation Driver, Columbus City Utilities - Manager of Finance and Business Operations, and Part-Time Kennel Assistant. Edinburgh's Document Center periodically posts employment listings. During review there had been an open position announcement for Police Officer. The Columbus Area Chamber of Commerce maintains data on area businesses. The Chamber is a great resource to use for exploring area businesses through their member directory, housing guides, and more. The Greater Columbus Indiana Economic Development can provide figures such as workforce overviews, active labor force numbers, wage and salary information, and more. This is a Worklooker directory for the Indianapolis area. It's similar in format to this Bartholomew guide. Columbus Regional Health employs physicians, nurses, therapists, pharmacists, clinicians, managers, administrators, and support staff. A survey of open positions discovered on this review date included Nursing Graduates ASN & BSN, Ambulance Paramedics, Attendant, Cardiac Sonographer - Registered, Certified Nursing Assistant (CNA), Coder, RN Jobs, Communication Specialist, Contractor - Emergency Services, Contractor RN through Focus One Connect - Radiation Oncology, Cook, Diagnostic Medical Sonographer Ultrasound, Director of IS Infrastructure, Director IS Applications, Emergency Medical Technican EMT, Environmental Services Jobs, Fitness Instructor, Physchiatric Nursing Jobs, Food Service Aide, CCU Nursing Jobs, Information Systems Analyst, Information Systems Security Specialist, Licensed Practical Nurse, Medical Assistant Medical Oncology, Medical Technologist, Nurse Practitioner, Phlebotomist, Physical Therapist, Polysomnographic Technologist, Radiation Therapist, Registered Nurse Critical Care Unit, Registered Nurse Medical Surgical, Registered Nurse Psych - Adult Mental Health, Registered Nurse PACU, Utilization Management RN, Registered Respiratory Therapist, and more. Silver Oaks Health Campus offers a complete continuum of care and services such as adult day health and assisted living services in elegant residential facilities with skilled nursing. Job openings found had included Internal Marketing & Admissions Specialist, Cook, Director of Food Services, Housekeeper & Laundry Assistant, Resident Care Associate Caregiver, Registered Nurse RN, Licensed Practical Nurse LPN, Dietary Aide, Certified Nursing Assistant CNA, and Transportation Driver. Willow Crossing Health & Rehab provides skilled nursing care and rehabilitation services in Columbus, Indiana. Willow Crossing Health & Rehab is a part of Magnolia Health System. Periodically nursing jobs and other positions become available. Kindred Transitional Care and Rehabilitation hires Nurses, Certified Nursing Assistants / Support Staff, Nutritionists, Social Workers, and Therapists. Hickory Creek operates skilled nursing centers throughout Indiana. Hickory Creek periodically recruits professionals at various times. Visit their careers page for more information. Bartholomew Consolidated School Corporation had a number of open positions on this review date. Employment opportunities found had included Prekindergarten Teaching Assistant, Building Administration Job, Prime Time Teacher Assistant, Special Education Teacher Assistant, Early Childhood Special Education Teaching Assistant, Parent Engagement Interpreter, Early Learning Center Sub, Supply and Delivery Driver, i-CARE - after Care Teaching Assistant, i-CARE - before Care Teaching Assistant, School Custodian, Special Education Teacher Assistant Part time, Bus Driver, Pre-K Substitute, Special Ed Sub TA, Substitute School Nurse, Bus Monitor, Not Specified, Certified Staff Job Postings, and Choral Teacher. Indiana Wesleyan University - Columbus Indiana Campus periodically posts Adjunct Faculty positions. Check for updates. The Bartholomew County Sheriff's Office is accepting applications for the position of Deputy Sheriff. Preferred applicants will have a minimum of 60 college credit hours from an accredited college and/or equivalent work experience. The Columbus Indiana Police Department recruiting page provides information for how to become a Police Officer, requirements for employment, hiring process, salary and benefits. LHP Software delivers exceptional value in Embedded Software Solutions and Resident Engineering Resources to a wide variety of industries, especially automotive, medical device, healthcare information systems, and clean energy. During review there appeared to be a high volume of open positions available. Force Construction Company, Inc. is a construction broker and full-service self-performing general contractor located in Columbus. Opportunities for employment may be explored by directing your questions to the Director of Human Resources. Headquartered in Columbus, Indiana, Cummins currently employs approximately 55,000 people worldwide. A high volume of employment opportunities were posted during this survey. Cummins designs, manufactures, distributes and services diesel and natural gas engines. Toyota Material Handling had a number of open positions in Columbus during this review. Positions found had offered Competitive Salary, Medical, Dental and Vision Insurance, Life and Disability Insurance, Employee Assistance Program EAP, and 401(k) Retirement Plan. Faurecia has grown to become a major player in the global automotive industry. This employer had a high-volume open positions available. A sample of jobs reviewed had included Electrician, HR Generalist VIE, Accounts Receivable Specialist, Prototype Order Coordinator, Regional Operations Controller, Health - Safety & Environment Coordinator, Tool and Die Maker, IT Shop Floor Administrator, Sales Manager, Manufacturing Engineer, General Ledger Accountant, Assistant Controller, Quality Engineer, Automation Engineer, Financial Analyst, and Electrical Controls Engineer. Caltherm Corporation is an industry-leading manufacturer of thermostatic and pressure control devices. During review there were open positions for Full-time and Part-time Production Operators. WestRock manufactures corrugated containers in Columbus. WestRock has manufacturing facilities, recycling, design centers, research labs, and sales offices around the world. NTN Bearing Corporation operates more than fifty plants worldwide and is the third largest bearing manufacturer in the world. During review NTN had a number of job postings. Positions found had included Engineering Intern, Machine Operators, Electrician, Forge Hot Press Operators, Production Supervisor, Continuous Improvement Manager, Supplier Quality Engineer, Manufacturing Engineer, Heat Treat Coil Tech, Bilingual Mechanical Engineer, Maintenance Machinist, and Assembly Operators. To learn more about employment opportunities with Sunright America, Inc., click the Apply Now button on their home page. You may apply online and their H.R. Department will contact you about any positions available. Dorel Juvenile is the world's leading juvenile products company. Products excel in safety, design and usability. Careers may include specialties such as Plant Engineer, Industrial Engineering Manager, Child Restraint Test Technician, Manufacturing Quality Assurance Engineer, Tooling Engineer, and Senior Design Engineer. Walmart, the world's largest retailer that provides an array of career areas with good training and flexibility. 75% of store management teams began as hourly associates, and they earn between $50,000 and $170,000 a year. MacAllister Rentals - The CAT Rental Store rents, sells and services a wide range of high-quality equipment from Caterpillar and over 50 other manufacturers. Rental Technician, Sales Rental Counter Sales Rep, Truck Shop Technician, Driver -Tractor Trailer, and Parts Corrdinator are among the jobs that could periodically become available. Edinburgh Premium Outlets advertises some retail jobs on Simon's job board. Edinburgh Premium Outlets features 85 stores. Elwood Staffing is recognized as one of the largest staffing firms in the United States. In Columbus examples of jobs they may become available include Patient Account/Insurance Representative, Machinist, Outboud Dialing Agent, Administrative Assistant/Purchaser, Machine Operators - Assembly, Production Jobs - Walesboro, IN, Part-time Manufacturing Associate, Manufacturing Jobs, Assembly Workers, Assembly Jobs, Maintenance Technician, Injection Molding Processor, trabajador de produccion en Enkei America, and more. First Financial Bank has been in the business of client service and success for 150 years with more than 100 banking centers in 3 states. Centra Credit Union is a non-profit financial institution that offers periodic career opportunities in Columbus. Jobs found included Accounting Specialist, Indirect Loan Processor, and Member Service Associate. Indiana State employment opportunities are listed through IN.gov. Eligible employees have access to a competitive benefits package that includes health insurance, paid time off, retirement and vacation benefits.